The rail industry comprises of sale, manufacture, and operation of railway technology. Rail transportation, primarily consisting of freight shipments and passenger service, plays a vital role in the economy of many countries. The world’s railway network spans over 1.3 million route-kilometers worldwide. 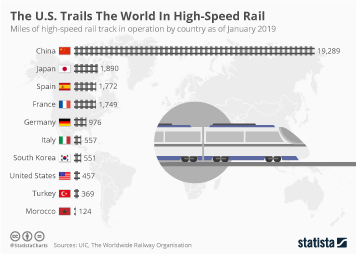 The United States operates by far the longest railroad network in the world, closely followed by Russia, China, India, Canada, Germany, and France. Switzerland and Japan were both adjudged number one in the ranking of countries with the highest quality infrastructure for railroads in 2017. The average annual market volume of railway technology in North America is forecasted to reach around 32 billion euros by 2023. Western Europe will be the region with the highest market volume. Asia Pacific accounts for the largest rail passenger traffic globally. In 2017, passengers in the region travelled up to 2.2 trillion passenger kilometers on railways. In 2017, the leading railway vehicle manufacturer was CRRC Corporation. The company is a state-owned enterprise headquartered in Beijing and formed in June 2015 from the merger of China CNR Corporation and CSR Corporation Limited, the leading rolling stock manufacturers in the world. In the fiscal year of 2017, CRRC generated operating revenue to the value of 32 billion U.S. dollars. In response to the intensified competition and efforts to push past the Chinese manufacturer, Germany’s Siemens and France’s Alstom merged both their railway manufacturing units in September of 2017. Earlier in 2016, Siemens raked in around 7.8 billion Euros in revenue from its mobility segment. In North America, one of the leading railroad company based on revenue was Union Pacific. In 2017, the company generated over 21.2 billion U.S. dollars in revenue. U.S. railroads are divided into Class I railroads and other railroads. Between 1995 and 2012, the number of Class I railroads declined from eleven to seven railroads. The number of other railroads increased to 567 in 2012.